I grew up in the Bay Area and received a Bachelor's Degree in Animal Science/Pre-Veterinary Science at Cal Poly Pomona. 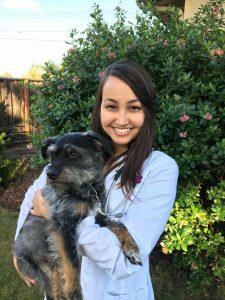 I graduated from the University of California Davis, School of Veterinary Medicine and upon graduation, received the American Animal Hospital Association's Proficiency in Primary Care Award. I enjoy every aspect of general practice. In addition to dogs and cats, I have a strong interest in avian, small mammal exotic and reptile medicine. One of my greatest joys in veterinary medicine is getting to be part of the special bond that people have with their furry, feathered and scaled family members! In my spare time, I love to be with my family, including my energetic young son, supportive husband, two sassy cockatiels and adorable dachshund/terrier rescue. I also enjoy eating delicious food with friends, baking, hiking, and knitting. Our group is super excited to have Dr. Breeden as part of our team! You can make an appointment for your pet to be seen by Dr. Breeden at both Pinole Pet Hospital and Disney Pet Hospital.